Join us for an afternoon of music, food, prizes, and building community. 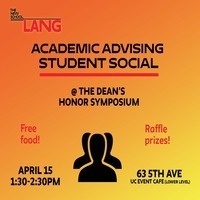 Meet students from other majors/departments, see the amazing student work that is part of the Dean's Honor Symposium, and participate in a scavenger hunt with prizes! Students who attend the Dean's Honor Symposium Panels (schedule below) will be given a raffle ticket for a chance to win $25 loaded onto their New School Card. We will be raffling off 6 prizes (one for each panel) during the reception at the Dean’s List and Student Award Ceremony (6-7:30pm in Tishman Auditorium). Attend more panels to increase your odds!